paradise never sounded So Good. Friday & Saturday Nights Starting at 9PM in 5 o’Clock Somewhere Bar and at 10 PM in Margaritaville! Visit margaritavilletulsa.com for a complete schedule. • IRON MONK BREWING CO.
MARSHALL BREWING COMPANY • NEW ERA: FINE FERMENTATIONS NINE BAND @ OSAGE CASINO • NOTHING’S LEFT BREWING COMPANY • OK CIDER CO. RAK HOME BREW • REPUBLIC NATIONAL DISTRIBUTING CO. • RENAISSANCE BREWING CO. SOUTHERN GLAZER’S WINE AND SPIRITS OF OKLAHOMA • VANESSA HOUSE BEER CO.
6:30PM-9PM • BEER TASTING • YARD GAMES • LIVE MUSIC • 21+ EVENT LANYARD SPONSOR : RANCH ACRES WINE & SPIRITS Special thanks to these zoo partners for building a better zoo through their continued support. Take light bulbs to the Household Pollutant Collection Facility. Donate dishware or throw it away in the gray trash cart. Glass bottles and jars are perfect for recycling, but light bulbs and ceramic dishware are NOT acceptable for the blue recycling cart. Simply The Best Wuänä was developed to educate and introduce people to a natural alternative. We are licensed to grow and process medical cannabis under Oklahoma law. Our 19,000 square foot facility hosts our growing and extraction equipment. Our extracts come from highest quality CO2 extraction equipment. We have selected the best extractor in the industry The Precision® X10 MSE (Multi Solvent Extractor) which provides the best of both worlds by extracting with hydrocarbon AND ethanol-based solvents. Because it is ASME certified, the X10 provides the additional benefit of allowing for the use of pressures (up to 200 PSI) for the production of superior full spectrum cannabinoid and terpene removal. TULSA’S FINEST CANNABIS Join us for our 4/20 special! $.01 PRE-ROLLS WITH EVERY PURCHASE OVER $50! icking on Mitt Romney is as easy as hitting a piñata full of alarm clocks and kittens without a blindfold in broad daylight—but for the love of the cauda equina, the bundle of spinal nerves and spinal nerve rootlets of the lumbar cistern, if the former Massachusetts governor were any more spineless, echinoderms would be telling him to grow a pair. Romney, who has been Utah’s senator for fewer than four months, was on “Meet the Press” on April 7, and is already ashamed of his work and his title. That’s it? You were against a bill years ago the president just recently and cynically dangled in front of Congress in a clunky, transparent attempt to get his cockamamie wall funded, and that shows off your cojones? What made the moment more absurd, as impossible as that was, Romney immediately walked back even that nothing burger. CHUCK TODD: Do you prefer Governor or Senator still? Shorter Romney: If you’re watching Mr. President, please don’t hurt me. Romney, rather than taking off the gloves in criticizing Trump, lathered his hands in Neosporin, wrapped them in gauze, put on a pair of mittens, and put both hands under his underarms. CHUCK TODD: Are you still against — SEN. MITT ROMNEY: — we’re on the same page. SEN. MITT ROMNEY: The term Governor’s always better, but I guess I’ve got to go by my current title, which is Senator. CHUCK TODD: That’s exactly what we — SEN. MITT ROMNEY: But Mitt—but Mitt is just fine, Chuck. Mitt is just fine. Yes, exactly. Todd pulled that quote out of the bag to prove Romney’s disgust with the president’s moral failings. (How will Trump ever recover from such a rhetorical beatdown is beyond me.) Todd reminded Romney that he, Romney, once said he was, compared to Trump, the true badass when it came to opposing the hordes of foreigners from “shithole countries” coming to our border. Short of shooting little Ecuadoran kids in the back as they ﬂee the border, I’m not sure how that is actually possible, but Todd pursued the questioning. CHUCK TODD: One of the things that you had said is you’d be tougher on illegal immigration than President Trump. Your positions. Give me an example where you feel as if you’re tougher on this than he is. SEN. MITT ROMNEY: Well, I was referring to a time some years ago when I was running for president and, and noted that I was not in favor of the DREAM Act. SEN. MITT ROMNEY: I would provide legal status for those Dreamers in the country. That’s something the president’s put on the table. I think we should get that job done. And hope we will get that job done. He would treat human beings as human beings. Leadership! But overall, we need to complete the border fence. And then we’ve got to deal with this asylum issue that’s really overwhelming our system. Romney doesn’t want people working here illegally and wants to deal with the asylum issue. This, apparently, is what passes for special moxy in the GOP these days and gets you booked on Sunday mornings. CHUCK TODD: You, you have, you were very aggressive in getting, in getting candidate Donald Trump to try to release his tax returns. This assumes, as the kids like to say, facts not in evidence, but please continue. He now wants to fight this effort by Congress all the way to the Supreme Court. And while I could maybe understand he wants to do it on privacy grounds, he still doesn’t want to show the country his tax returns. How problematic is that? Okay, senator — uh, governor — you released your tax returns, 12 years worth, and were not exactly Albert Schweitzer in your adult years. You also took the heat for your 47 percent comment. Bring the hammer, as it was brought against you. SEN. MITT ROMNEY: Well, I’d like the president to follow through and show his tax returns. He said he would. “I’d like the president—” Wait, that’s not a hammer. Try again. I think it was on The Today Show. He said he would be happy to release his returns. So I wish he’d do that. returns. So he’s going to win this victory. He wins them time after time. Wins what time after time? And what about the point of the release? And, you know, the Green New Deal, all these candidates out there talking about getting, getting rid of Obamacare and traditional health care and putting in place Medicare, these things are just, just nonstarters. Todd, through the entire discussion of healthcare, didn’t remind Romney of that, for reasons that defy understanding. Worse, he let Romney get away with this: And I think the Democratic party is finding itself in a real difficult position with those kind of positions. Hilarious. In returning to the premise— Romney’s moral outrage at the president —Todd asked the former governor about whether anyone in the GOP would challenge Trump in 2020. Romney recalled the time he curled up into ball and started cooing at the White House. SEN. MITT ROMNEY: I have places where I disagree with the president. I was in his office just a couple weeks ago and said I disagreed with the steel and aluminum tariffs. No word if he rolled over and had his underbelly stroked. In my opinion, you can get as hard as you want to get, pushing back on China. I think you also have to say the president has followed the Republican playbook when it comes to the domestic economy. Lowering taxes, lowering regulation. The economy’s doing very, very well. It’s hard not to recognize that’s a pretty strong record. But what of the question, Senator/Governor/Bain Capital Man, of a primary challenge? Are you concerned about the president’s morality and character, or not? Will you, yourself, consider running, for the sake of the GOP, for the sake of the country? Will you encourage others to do so? SEN. MITT ROMNEY: As to whether or not there’s a primary, time will tell. But parties typically do just fine when there’s a primary. If Romney were any more irresolute, he would have wafted away like pollen through an open window. a For complete citations, visit the hyperlinked version of this story at thetulsavoice.com. sures is bound to pass within the next year or two. “State question 780 and 781 passed with very strong majorities across the state,” Gentzler said. “And more recent polling in the last few months tells us that support for 780 and 781 has only grown since it was implemented. So, the scare tactics from law enforcement and district attorneys has really not worked on the whole.” State question 780 reduced some drug penalties from felonies to misdemeanors, while 781 did the same for felony property crimes. Nationally, California, which legalized recreational marijuana in 2016, has announced it will expunge the records of marijuana convictions. Baltimore’s State Attorney Marilyn Mosby said her office would no longer prosecute marijuana possession crimes. And with New York set to legalize recreational use, black NY lawmakers are pushing the state to go further by ensuring communities that were disproportionately harmed by the failed War on Drugs are given reparative justice in the form of funds for job training and business licenses in the new industry. Street Cred brings an underused area of town to life for a day. This year, TYPROS is teaming up with Tulsa Art Alley to turn a forgotten part of downtown into a creative oasis. An urban park and event space in the heart of Tulsa’s Art District. Larry Bump graduated OSU in 1964, and his daughter followed suit with a degree in management information systems in 1994. “I feel compelled to say that I washed out of the hospitality program,” she said. “It sounds bad, but the weed-out course was food prep; it’s the one that got everyone, mostly because of the 8 a.m. lectures on food preparation.” Bump Davis said the family supports the Forum because of who it benefits, both the students at OSU and the wine culture of Oklahoma. “The students work so hard to make this event happen, and their hard work has paid off in that we have these amazing people coming to Stillwater to participate in what is becoming a world-class wine event.” Several Tulsa chefs and restaurants also participated. Southern Hills executive chef Jonathan Moosmiller prepared the gala dinner, and Tulsa restaurants from the Justin Thompson Group and McNellie’s Group, as well as Laffa and SMOKE. on Cherry Street were on hand for the Saturday night grand tasting. Amanda Jane Simcoe, a private chef and cheese monger, was part of a group called Friends of HTM (Hospitality-Tourism Management). A guide to safely ingesting edibles Pay close attention to dosages. Just like with any medication, taking too much can cause adverse effects. Edibles can take up to two hours to kick in. Be patient. It is not advised to drink alcohol—interactions of the two can cause nausea, vomiting, dizziness, and other symptoms—and remember to stay hydrated. When taking for the first time, find a comfortable location and give yourself time to determine how it affects you. Every person metabolizes differently. Ate too much? Don’t panic! Find a cozy spot to ride it out and drink plenty of water. VEGGIE SAUTEE WITH WHITE RABBIT MEDICATED BUTTER AND SALT START TO FINISH: 30–40 MINUTES SERVES 4 1 pound baby or medium carrots (approximately 2 bunches), cleaned. Leave greens intact. 3 tablespoons of White Rabbit Butter 3 cloves garlic, minced ½ tablespoon Italian seasoning ½ White Rabbit Medicated Salt ¼ teaspoon fresh ground black pepper Preheat oven to 375 F. Lightly grease a baking sheet. Place carrots onto the baking sheet and add butter, garlic, Italian seasoning, medicated salt and pepper. Toss to combine. Arrange the carrots in a single layer. Wrap greens in foil to protect from burning. Place baking sheet into the oven. Bake until tender, about 35-40 minutes. SOUS VIDE DECARBOXYLATION To release the THC from weed, it must be “decarbed,” or heated. Here are directions for decarbing marijuana in its raw form. Or as Dartez likes to say, “Sous vide yo weed.” 3.5 g of cannabis 1 airtight jar or vacuum-sealed bag 3 quarts of water Heat water to 202 F. Break apart cannabis into small pieces and place in an air-tight glass jar or vacuum-sealed bag. Place jar or bag in water and leave it alone for an hour. Remove jar/bag carefully. Cannabis should be dark brown in color. Let it chill. Coarsely grind the cooled cannabis and store in an air-tight container for future use. Finer grind if using it in drinks or smoothies. Infuse oils by simmering on super-low heat for an hour, then strain. Shelf life for decarbed cannabis is around two weeks. 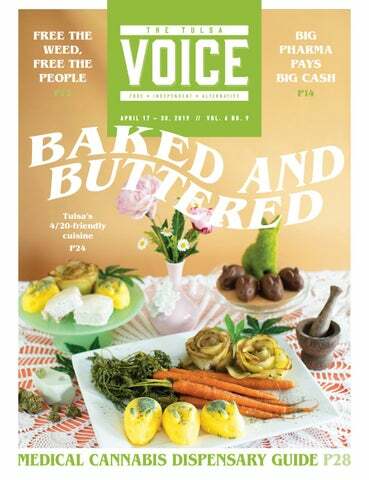 SUBSCRIBE TO THE TULSA VOICE INSIDER E-NEWSLETTER so you'll always be in the know about what's happening in Tulsa! CANNED FOOD DRIVE • 4/14- 4/20 Patients must bring 4 canned items and make a purchase to earn 20 raffle tickets. 549 E. 36th St. N.
15% OFF STOREWIDE Must have valid medical marijuana card for purchase. Deals do not stack. hockey’s been played in Tulsa, and I’m proud of the team that we’re able to accomplish that. But I would be disappointed if we don’t make a deep run, to be honest with you.” Leading the Oilers has been 30-year-old captain Adam Pleskach, who put together a stellar performance in his sixth year with Tulsa, leading the entire ECHL with 38 goals and finishing second with 75 points. “He’s meant everything to us,” Murray said. “He’s a quality person. He’s a great captain—a character hockey player. He just gets it done every day, be it in practice or the games, and never takes a day off. For me, he’s priceless, really. When you look back, without Adam Pleskach, I don’t think we are where we are.” The humble Pleskach, whose previous career highs were 24 goals in 2015-16 and 52 points last year, deﬂected any praise to his teammates. Saturday, April 20, 1–7 p.m. Guthrie Green and Philbrook Downtown, guthriegreen.com Celebrate the conservation of our beautiful planet with a day of Earth-centric events and speakers, including Sierra Club Executive Director Michael Brune. There will also be educational booths and demos, family activities, and live music. Support your local dispensaries! // This year, they’re truly the reason for the season. The Popovich Comedy Pet Theater Show at Tulsa Little Theater // Ok, yes, this show is two days before 4/20, but it’s a shoo-in for this list because … pet tricks. Waldo’s Forever Fest at Route 66 Cannabis Dispensary // This day-long event will feature vendors, cannabis education, live music, a food truck Munchie Court, giveaways, and more. 420 Patio Party at Fuel 66 // Vendors, live music, and five food trucks to nip those munchies in the bud. Earth Day Celebration at Guthrie Green // Because it’s the Earth, man! Celebrate it. Go see some live music! // Whether you want to chill out or have your mind blown, find the right show in our music listings on pg. 38. FlowerCraft Event Center Grand Opening // Find more information on pg. 26.
rounding country that was pretty beautiful. I’m definitely planning and hoping to get a few rides in when I come back to Tulsa at the end of the month. for me, it’s a lot of very electronic music, there’s a lot of singing, there’s not a lot of guitar playing on it—it’s a different kind of musical landscape. POWELL: Recently, you’ve been recording in Barcelona, reading poetry at Ferlinghetti’s birthday celebration, and performing various shows. What else have you been up to? POWELL: What’s your connection to Dylanology? huge change in our culture, what [Dylan] provided. He was not alone in that period of time, but he was pretty unique. The thing I always say is that he’s been in our eye, I don’t even know anymore, probably sixty years as a performer, and he remains a very mysterious character. That is a feat in itself after 60 years, for the public to still not know who you are. It’s a pretty magical feat. He continues to keep us guessing. POWELL: What’s it like being in a band and making music as a group, as opposed to Dylan, for example? THIS MACHINE BLOWS OUT THE CANDLES Woody Guthrie Center’s Sixth Anniversary Celebration by TTV Staff Woody Guthrie Center will ring in six years with six days of concerts and events, including a two-day symposium on folk roots and current events. We also JOY IN GOD through our LORD JESUS CHRIST. Tulsa is full of rich history with iconic structures that are worth saving. FIRST CHURCH OF CHRIST, SCIENTIST Tulsa’s independent and non-profit art-house theatre, showing independent, foreign, and documentary films. Free legal representation for first offense marijuana possession. Tulsa District & City Courts only. No juvenile cases. Reasonable fees for other charges. Some restrictions apply. OPENING APRIL 19 THE BRINK Documentarian Alison Klayman follows former Trump political strategist and white nationalist Steve Bannon as he travels around the country during the 2016 midterm elections. Not Rated. The best of Tulsa: music, arts, dining, news, things to do, and more. OPENING APRIL 26 HIGH LIFE A provocative, sexuallycharged sci-fi drama starring Robert Pattinson about a group of prisoners on a space mission to find alternate energy near a black hole. During the journey, they must undergo sexual experiments led by a cruel doctor (Juliette Binoche). It’s the English-language debut of French filmmaking legend Claire Denis. Rated R.
Come find out what ’s happening. AMAZING GRACE The stirring, critically-acclaimed documentary about Aretha Franklin’s seminal live recording of a Gospel album at a Los Angeles Baptist Church. For two showtimes on Saturday, April 27, the Metropolitan Baptist Church Choir will perform live prior to the 4:30 p.m. and 7 p.m. screenings. 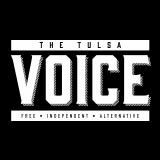 TULSA TALKS is TulsaPeople’s podcast on Tulsa’s community and culture. Subscribe for FREE on Apple Podcasts, Google Play or Spotify! THE BIGGEST LITTLE FARM An inspiring documentary for the whole family about one California couple’s eight-year journey to transform drought-depleted land into a place of diverse habitats, where various crops, animals, and vegetation could thrive. A panel discussion follows the debut screening on Thursday night, April 25. Rated PG. Episodes are released the 1st and 3rd Wednesdays of each month. The Tulsa SPCA has been helping animals in our area since 1913. The shelter never euthanizes for space and happily rescues animals from high-kill shelters. They also accept owner surrenders, rescues from cruelty investigations, hoarding, and puppy mill situations. Animals live on-site or with foster parents until they’re adopted. All SPCA animals are micro-chipped, vaccinated, spayed/neutered, and treated with preventatives. Learn about volunteering, fostering, upcoming events, adoptions, and their low-cost vaccination clinic at tulsaspca.org. LONDON is a three-year-old Dalmatian mix with lots of energy! Give her a toy with a squeaker and she’ll entertain herself for days. This smart girl plays hard and would prefer being the only dog in a house without small kids. At nine months old, HUCK is still a pup. He loves everyone he meets and is always smiling. Huck is always ready to entertain others with toys, and his foster family said he’s already house trained. CHARLIE is a lovable, active girl. She loves running around with or without other dogs. This water-loving pup is also a big fan of taking a swim in the pool and playing with her toys. She’s four years old and 42 lbs. © 2019 Andrews McMeel Syndication 46 // ETC. Pleas e re cycle this issue.